Unfortunately, we see these kinds of tragic stories all of the time. A poor victim is killed by an irresponsible and reckless driver. Driver leaves the scene. The poor family of the victim cries out for justice. Eventually, the driver turns himself in or is captured. 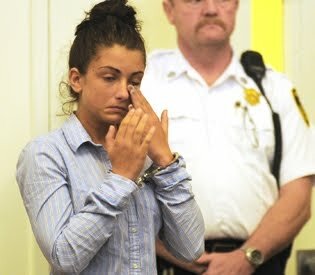 The story of Gina Giovangelo's hit and run accident on the Cape is no different. Except for the part where Ms. Giovangelo arrives at court for her arraignment wearing a sweat suit! As a civilized society, have we really declined so far that 1. this poor girl feels it appropriate to appear in court to answer for her allegedly killing a woman in a wheel chair and leaving the scene, wearing her very best black tights and pink hoodie?! Really? Or have we declined so far that 2. her friends and/or family sanctioned this decision as appropriate? If I had to go to court to dispute a speeding ticket, you better believe that I'd be well dressed and groomed in order to make as positive impression on the court and the players involved as possible. It's called a "standard". It's called "dressing appropriately" for the situation. And what more important situation is there warranting looking and appearing as respectable as possible if not an arraignment for vehicular homicide? To be fair, Ms. Giovangelo did appear the second time wearing a button down shirt. A big improvement from the "whatever" image of sweats and a hoodie. There are indeed times where casual dress is desired and even appropriate. Nothing wrong with that. But when we as a collective, less and less make the correct distinction between what is appropriate and what is not, something IS wrong.